The more people know about a competition, the better for everyone - organizers, competitors and the Armpower.net community. 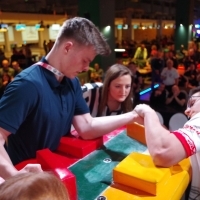 So, if you know of any events that are not in our calendar or if you are an organizer - please fill out the form below and let the ArmWrestler community know! Please provide the most important information about the competition, e.g. the rules of competition, the program of the competition, the prize information (if relevant), how to get to the venue, accommodation or contact with the organizers.